I just got back from a 500-mile ride in the upper Baja of Mexico wearing the Alpinestars Rodeo Denim jeans. 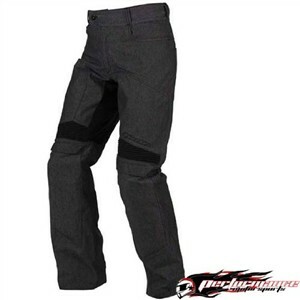 Are they the perfect casual armored riding pants? No. Are they good? Yes. I like them; and I believe they will become my primary riding wear in the summer months. Here are the details. The Rodeo Denims are, as the name would suggest, denim riding jeans. The denim is thick and comfortable. The jeans feature stretch panels at the inseam and an accordion stretch panel above the knee. I have sampled other protective denim jeans, and these are the most comfortable that I have found. There is a Velcro closure at the bottom of the pant leg. It's a nice feature, but the pants will still do some flapping at speed. As for a protection, these Alpinestars have CE-approved, layered armor in the knee and shin. That's the good news. I wish Alpinestars had sewn in a Kevlar layer in the seat and thighs. That added level of protection in case of a slide would have made these, in my opinion, the ultimate in denim protection. Do these jeans approach the level of protection of leathers? Not a chance. Are they better than riding in plain jeans? Yes, by a long shot. If you are looking for good mid-level protection, these Alpinestars are worth looking at.